The Bombay High Court issued guidelines in the matter of granting bail to Human Trafficking crimes. A Division bench comprising of Justices RoshanDalvi and ShaliniPhansalkar Joshi said that, the Courts shall, as a general principle, refuse bail to an accused who is shown as a trafficker in human beings. A Division Bench of Calcutta High Court comprising Justice NishitaMhatre and Justice TapashMookherjee of the Calcutta High Court rejected Former Minister Mr.MadanMitra’s request seeking seven days to surrender and directed him to surrender before the Chief Judicial Magistrate, Alipore immediately. 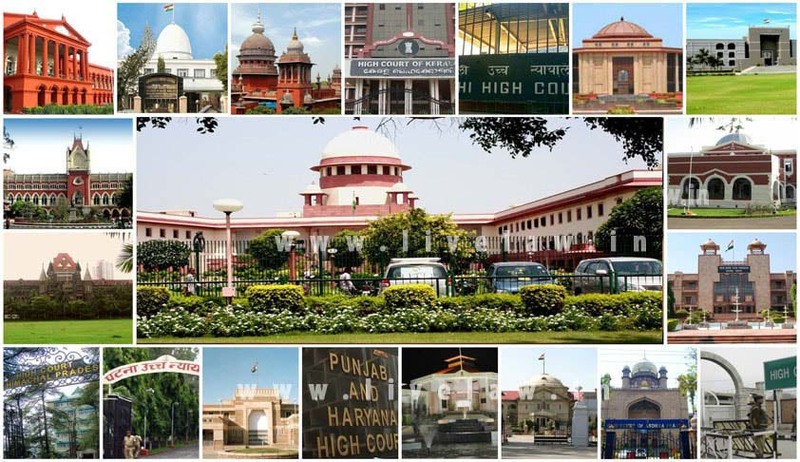 A Delhi High Court Bench headed by the Chief Justice has directed the Centre to reply on a Writ Petition seeking constitution of quasi-judicial tribunal to administer enforcement of Foreign Contribution (Regulation) Act, 2010 in order to avoid the misuse of FCRA. In a move for quick settlement of commercial disputes, the Court on Thursday set up six commercial division courts and four commercial appellate division courts for adjudicating commercial disputes of a specified value of which is above Rs.1 crore. The High Court on Saturday held that generic drug maker Cipla Ltd. was violating Swiss innovator firm Hoffman-La Roche’s patent in lung cancer drug erlotinib hydrochloride. Gujarat High Court held that ‘hurling abuses’ does not constitute cruelty to attract offence under Section 498A of Indian Penal Code. Justice J. B. Pardiwala quashing the complaint against in Laws, said that ‘moral guilt’ of not treating daughter in law with respect, could not be made an offence. The Dharwad bench of the Karnataka High Court struck down the Hindu Endowments Act, observing that there is little difference between the unamended Actand the amended Acts in so far as the offending provisions are concerned. The courtdeclared that the Karnataka Religious Institutions and Charitable Endowments (Amendment) Act, 2011 and the Karnataka Religious Institutions and Charitable Endowments (Amendment) Act, 2012, are discriminatory and unconstitutional. In a recent ruling, the court held that Manipal University does not come under the purview of the Right to Information Act. Overturning the decision of the Central Information Commission, Justice AnandByarareddy observed that Manipal University, being a deemed university as recognized under the University Grants Commission Act, 1956 and ‘not established under the act like a university’, would not come within the definition of public authority under the Act. Relief for Former Chief Minister of Karnataka, B.S. Yeddyurappa as the High Court set aside, the order of sanction for prosecuting him. Partly allowing the Writ petition moved by the former CM, a bench of Acting Chief Justice Subro Kamal Mukherjee and Justice Vineet Saran has remitted the matter back to His Excellency the Governor for re-consideration. Upon a Public Interest Litigation filed by one Nimisha, a social worker, raising concern regarding non-participation of large number of government employees in Independence Day and Republic day celebrations, the High Court of Kerala said that all the officers and staffs of the State Government must attend National Day functions. A Division Bench of Madras High Court asked the Centre to clarify whether Section 29A of the Arbitration and Conciliation (Amendment) Ordinance, 2015 would apply to pending arbitrations. Section 29A provides for a mandatory 12 month timeline for arbitrations to be completed (with an optional extension by 6 months subject to consent of parties) failing which parties have to approach Court and get an extension Order. A Single Judge Bench of the High Court recently held that degree awarded by a University without Plus-Two is valid if the concerned candidate passes entrance examination before being admitted to the degree course by the University. While hearing a case relating to allowing family pension to the second wife, The Madurai bench of the High Court held that officials should not insist on production of marriage certificate from Tahsildar or Registrar or District Court for sanctioning family pension when a widow produces ‘heir’ certificate. A full bench of Orissa High Court held that an intra-court appeal filed against the judgment of the Single Judge rendered in a writ petition in which direction for further investigation in a criminal case was sought for, is not maintainable. Full bench comprising of Chief Justice D.H.Waghela, Justices PradipMohanty and Raghubir Dash, answered the reference to it, by a Division bench, in negative.